ACOMP is an online monitoring system that continuously analyzes polymer properties during production in realtime. ACOMP uses a well-known, non-chromatographic technique to measure monomer and polymer concentration, intrinsic viscosity and weight average molecular weight. ACOMP’s automation and analysis software handles data acquisition, analysis and reporting in real-time. Polymethylmethacrylate (PMMA) is a highly transparent and weatherable polymer that can be used as a lighter and more impact resistant alternative to glass. PMMA applications include shatter resistant panels for windows, bathtubs, LCD screens, coatings and various medical and dental applications. PMMA can be synthesized in solution, emulsion or bulk polymerization. Crosslinking PMMA, by addition of a compound such as ethylene glycol dimethacrylate (EGDMA). yields a more ductile polymer with a higher glass transition temperature (Tg) which is desirable for certain applications. This application note describes how ACOMP was utilized to successfully monitor and characterize the solution polymerization of MMA in the presence and absence of this crosslinker. The ACOMP system uses an ultraviolet absorption detector (UV) and a differential refractometer (RI) for measuring the concentrations of monomers and polymer. The UV detector can use up to 4 wavelengths, 240 nm, 245 nm, 250 nm and 255 nm, for measuring the absorption of monomers. A single capillary viscometer and 5-angle static light scattering detector is used for measuring intrinsic viscosity and weight-average molecular weight respectively. In these experiments, ACOMP extracted a sample from a reactor recirculation loop at the rate of 0.5 ml/min. The reactor sample was automatically and continuously diluted 55x with butyl acetate (BA), the same solvent used in the reaction. 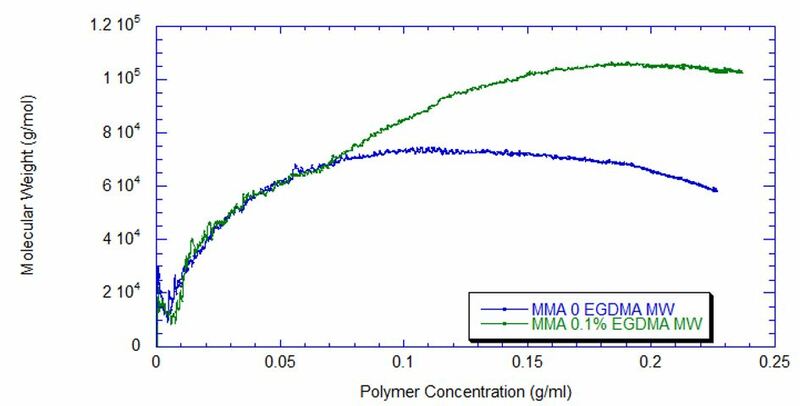 To typify the utility of ACOMP to monitor and characterize the effect of EGDMA as a crosslinker, two batch solution polymerizations of MMA were conducted at identical conditions. The reactor was charged with 30% by mass of total monomer in butyl acetate and then initiated with 3.5% azobisisobuylnitrile (AIBN) at 70 oC. The first reaction was carried out without crosslinker whereas the second reaction was carried out with 0.1% EGDMA (see Table 1). ACOMP successfully monitors the evolution of polymer properties like weight-average MW and Intrinsic Viscosity (IV) under these conditions. Figure 1 shows the ACOMP raw signals versus time. 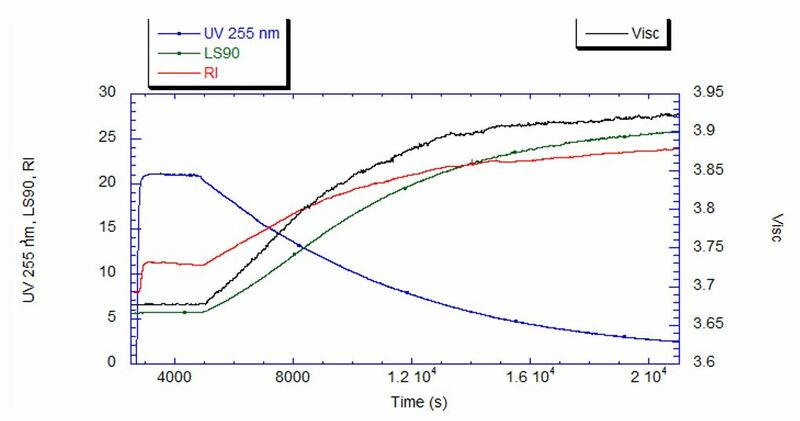 The UV at 255 nm, in blue, decreases exponentially as the double bonds in the monomer polymerize. The viscosity (black) and light scattering (green) increase due to both the continuously evolving molecular weight increase of the polymer chains as well as the increasing concentration of polymer. 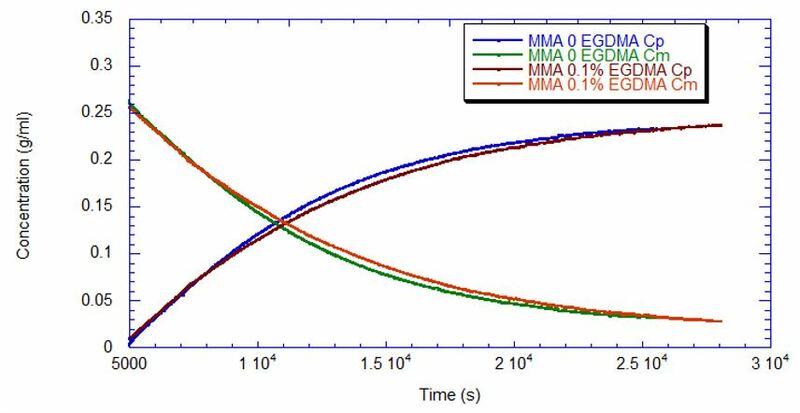 The differential refractometer signal (red) increases due to the increase of polymer concentration since the refractive index increment (dn/dc) of the polymer is higher than that of the monomer. The concentrations shown in Figure 2 are measured using the UV detector; since these are batch reactions the polymer concentration increases directly as monomer concentration decreases. Figures 3 and 4 display the evolution of IV and weight-average MW throughout the polymerization. As shown above, the conversion of monomer to polymer is directly proportional, so the evolution of polymer concentration is equivalent to conversion. ACOMP easily monitors the free radical solution polymerization of methyl methacrylate as shown in Table 2. The addition of just 0.1% EGDMA yields a 64% increase in molecular weight and a 45% increase in intrinsic viscosity suggesting that significant crosslinking has taken place. ACOMP is a powerful tool capable of analyzing a wide range of polymerization reactions at scales from R&D to industrial. In addition to its detectors, the system includes multiple prescriptive maintenance sensors, qualifying it as self-aware. 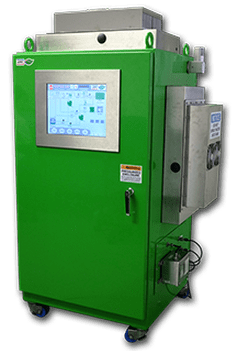 For industrial or pilot scale applications, where required, the ACOMP system can be provided in a fully purged, Class I, Division II cabinet. Figure 5 shows the Industrial ACOMP system.